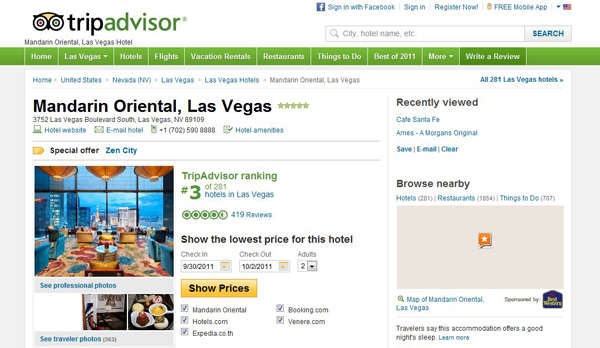 TripAdvisor Reaches 50 Million Visitors: But For How Long? TripAdvisor, currently the largest travel portal in the world, yesterday announced via a press release that it had reached a milestone of 50 million unique visitors each month, becoming the first stand-alone travel site to do so, according to statistics provided by comScore. TripAdvisor reaches 50 million unique visitors a month, but will it be able to keep them? The news will no doubt come as a welcome distraction for the site, which is currently batting to clear its name over allegations that many of its reviews may have been faked by companies looking to boost their reputations and harm that of their business rivals. comScore’s data showed that despite the controversy, TripAdvisor had seen a 22% increase in web traffic over the last year ending in July, boosted in part by its expansion into more than 30 different countries worldwide. Unsurprisingly, the website also took the opportunity to announce in the same press release that, according to the results of a recent study by PhoCusWright (paid for by TripAdvisor of course), more than 98% of respondents stated that they felt TripAdvisor’s reviews were accurate and provided a fair representation of the businesses involved. Of course, this looks like nothing more than a desperate attempt to brush the disturbing allegations against the website under the carpet. Claims that TripAdvisor’s reviews simply cannot be trusted, if proven, would surely wipe out a large majority of those 50 million unique visitors, especially with far more reputable sites such as Orbitz and Google entering the fray. Interestingly, TripAdvisor make no mention of the fact that they recently removed the slogan “reviews you can trust” from their website, replacing it with the words “reviews from our community”. According to TripAdvisor, the removal of the slogan had nothing to do with their being investigated by the Advertising Standards Authority – instead they rather feebly claimed that the change was introduced to “reflect the different aspects of our businesses”. The allegations, which relate to a complaint by the KwikChex online reputation management company, were made after KwikChex revealed that more than 2,000 hotels and restaurants had complained to the firm, disputing the accuracy and authenticity of the reviews found in TripAdvisor. This is really important information for those of us who visit Trip Advisor. I hadn’t noticed the change in the slogan which is very important. I’ll be less trusting of course. Better to have our eyes wide open when reading the reviews. Thanks!